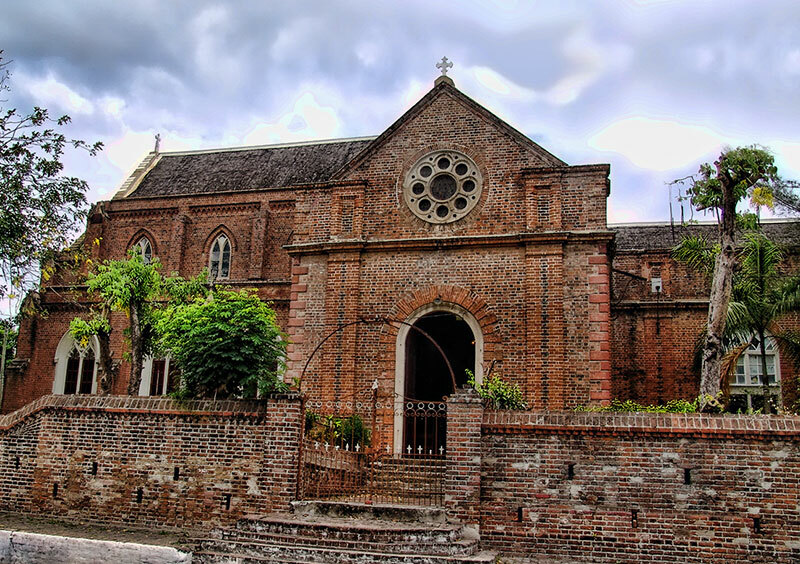 Like many Cathedrals in the world the Cathedral of St. Jago de la Vega in Spanish Town was built over time that covered two (2) decades of Jamaica’s colonial history. The progress of building a Cathedral is dependant upon the financial resources available for its construction. In the case of our Cathedral the financial resources came mostly from the colonial government financed by owners of the sugar plantations. The Cathedral of St. Jago de la Vega is essentially two buildings joined together at the juncture of the transepts and the chancel. The current nave and transept was built after the hurricane of 1712 and was dedicated in 1714 during the reign of Queen Anne. A tower was built in 1760 but it is not the current tower which was built in 1817. Before the construction of the 1817 tower, the congregation was summoned by a small bell hung on a wooden frame. The present Cruciform shape (in the shape of a Latin cross) was built upon the foundation of an earlier Spanish church. The nave and transept built in 1714 is in the Romanesque style which is characterized by the rounded shape at the top of the windows and doors. The current chancel which was built in 1848 is in the Gothic style which is characterized by the Gothic arches. You can see the transition where both styles come together at the entrance of the side chapels. In the early 1840’s taste changed which brought down the paneling to make the church conform to a proper gothic neo-medieval formula. The paneling and a decorated plaster ceiling became early casualties. Today’ interior with its dark stained planked roof angling up into the shadows and capping painted plaster walls effectively reversed the color scheme that the earlier generations of worshippers saw. The biggest change in the nave for regular churchgoers was the elimination of box pews along with its benches in the back under the organ loft. The earlier box pews could be rented and were reserved for only white families. The replacement pitch pine pews leveled the congregation in a new fashion. Pew rentals did continue but these distinctions were defined by cash, not colour. By the 1840’s architectural taste changed in England. A proper worship space became a neo medieval worship space. The Cathedral organist and architect Mr. John Calvert won the design competition to build the chancel under some controversy. The old chancel was pulled down in 1848 and the new chancel was considerably larger, far wider, longer and higher than its predecessor. It also reversed traditional proportions by towering over the older nave. John Calvert carefully reproduced a structure built upon 12th century Parisian patterns. The new chancel cost 4570 English pounds which would be 4,351,500 English pounds today or $63,096,750 in today’s Jamaican dollars and is now considered by many as the real beauty of this historic building. John Calvert saw the new chancel as the first stage towards the construction of a new Cathedral and so left the edges of the chancel walls uneven to allow for subsequent extensions to be keyed in. The height of the new chancel demonstrates Calvert’s ambitions. Calvert was disappointed and left Jamaica and eventually presented his “beautiful working model of a Cathedral erected in Jamaica to the South African Museum in Cape Town. The model has been lost. 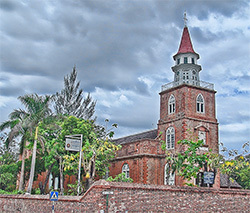 The Chancel project was pushed through during not only some of Jamaica’s most contentious political disputes of the century, but also an epidemic of cholera which struck Spanish Town particularly hard. 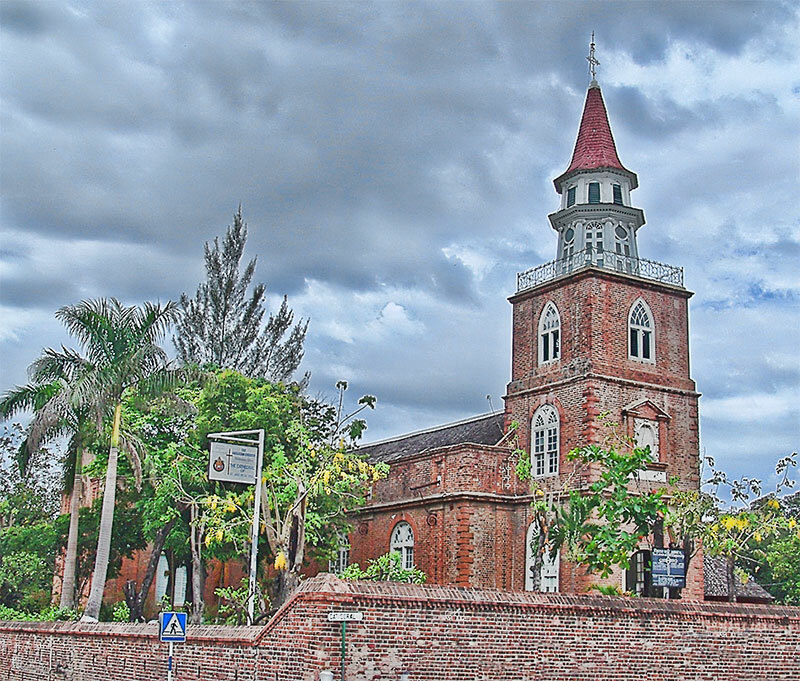 The Cathedral project stalled, but that it got as far as it did in such miserable times offers striking testimony to the legislative influence of the Anglican bloc in the Jamaica Assembly. The octagonal vestry, erected in 1932, stands to the south of the tower. One feature of the 1714 church (nave and transept) was beautiful mahogany-paneled woodwork that lined the walls of the nave and transept to a height of approximately 10 feet. This is why we see the monuments to the early planters high on the walls. The only evidence that we now have of the woodwork craftsmanship is the columns that now support the organ loft. The organ loft was built to house an organ that was installed sometime before 1755. The townspeople used the parish church as a venue for organ concerts just as we use the church today to reach out in public ministry with concerts, public lectures and other events. The polygonal mahogany pulpit raised on a stem is another example of mahogany craftsmanship and it was erected in 1764. It use to have a large “sounding board” behind it but was removed when the chancel was rebuilt. Of course this is no longer needed with modern electronic public address systems. The “bishop’s canopy” replaced the one that was erected for the Governor’s use in 1765, and this is an example of later mahogany craftsmanship. The east altar window along with the many monuments highlights the Cathedral’s close association with the history of the island from the middle of the seventeenth century. Men famous in the island’s history lie within the walls and the expression of public esteem is manifest in the number of beautiful sculptures and tablets which adorn the Cathedral’s sacred walls. Governors, Statesmen, Judges, Doctors, patriots and their ladies (who’s influences must have done much to soften a stern age) and representatives of every profession lie side by side with many humble folk in what is really the most historic spot in Jamaica today. The monuments indicate the close relationship of the Cathedral and the Colonial Government which resided in Spanish Town. Some of the most outstanding monuments surrounded the old altar of the chancel before its expansion in 1848. The marble monument to Governor Lord Howard of Effingham which was commissioned in 1792 and the one to Governor Sir Brian Keith was placed into side chapels. Memorial slabs to the colony’s seventeenth century governors which previously lined the floor around and under the former altar were pried up and taken outside. Instead of reinstalling any of the old memorial floor slabs in the Chancel, the whole floor was re-tiled with the latest English neo-medieval glazed tiles, whose designs copied fourteenth century floor tiles recently discovered at Westminster Abbey. Also noteworthy is the decorations on the outside of the Chancel which features two African bust interspersed among the kings, queens, bishops and martyrs whose sculptured heads decorate the outside bases of the window arches. The celebrated 18th century sculpture John Bacon (1740-1799) produced twelve principal works for Jamaica. The most important of these monuments is the Rodney statue in Emancipation Square. The Cathedral is fortunate to house three Bacon monuments. Of the three Bacon monuments, that to the Earl and Countess of Effingham, erected by the people of Jamaica, is the loveliest and (next to the Rodney memorial) most important work of the sculptor in Jamaica. (Rodney’s Sculpture was commissioned for 1,000 English pounds which would be 7500,000 English pounds today or $6,232,000 Jamaican dollars. It is not a stretch to imagine that monument to the Earl and Countess of Effingham in the Cathedral would have cost half of the Rodney statue, or approximately $3,000,000 Jamaican dollars today. By the way, it was during the Earl of Effingham’s Governorship that the bread fruit and other trees were imported from the South Seas to Jamaica. A monument to Ann, wife of Sir Adam Williamson, who was Governor after the Earl of Effingham, was executed by Bacon in 1798. In 1795 Williamson was invested with the Order of Knight Commander of the Bath and soon after left the island to take up the office of Governor General and Commander-in-Chief of St. Domingo. The last of the Bacon monuments in the Cathedral – that to Dr. Francis Rigby Brodbelt – erected in 1799 – must have bee one of Bacon’s last works. On this monument the Genius of Medicine is represented supporting the figure of Hope. His monuments can also be found in St. Paul’s Cathedral in London, Salisbury Cathedral, Bath Abby, Bristol Cathedral and the Cathedral in Leicester. His best known work in London is George III and the River Thames in the courtyard of Somerset House and sculpture on the facades of Trinity House, near the Tower of London, and Guy’s Hospital. His sculpture is in the neo-classical style which was the popular artistic style during his lifetime. Bacon’s girls are classical, full-figured and clothed in Hellenistic drapery. His men are cast more as Roman senators, noble and patrician (the Rodney statue is a good example). Another manifestation of the love of Greek and Roman culture of the day was the architecture which we call “Georgian.” This architecture style copied the formal columns and structure of Greek and Roman buildings. We still see this love of Greek and Roman “Georgian” columns in Jamaica on much less grandiose buildings. In some ways this has become a “vernacular” architectural style in Jamaica. There are other monuments of high artistic merit including the lovely memorial to Sir Basil Keith done by J. Wilton, R.A. and the Countess of Elgin by Sir John Steell. A much later bust and monument to the first Archbishop of the West Indies, the Most Rev. Enos Nuttall is also noteworthy for its artistic excellence. Former President of the Parish Council, Dr. Matthew Gregory was a very prominent Anglican who bequeathed in his will of 1756 established an endowment called “Gregory’s Trust” which provided for the maintenance and support of poor persons. A marble monument to Dr. Gregory and a framed description of the his bequest both hang in the Cathedral. The east stained glass altar window contains fifteen squares set in mullions in the lower portion, terminating with the six greater lights designed in multifoils and five lesser trefoils. The central light in the second row from the base has the Jamaica Coat-of-Arms, to the left is the shield of the Diocese of Jamaica and the Cayman Islands, and on the right is the shield of the donor. At the top in small circles are representations of the Dove and Agnus Dei; in the lower light the “I.H.S.” in nimbus. At the base is the following inscription – “The gift of the Honourable Sir Joshua Rowe, C.B., Chief Justice, A.D. 1848. Following the earthquake of 1907, two large rose windows were added to the north and south transepts which replaced large circular windows that existed before.